Philippines’ first and leading wheatgrass brand has recently signed one of the most admired Pinoy rock bands Sponge Cola as its newest endorser. The first and only wheatgrass brand that uses leaves to the roots that’s cleansing, alkalizing, and nourishing, it’s also most prized for its abscissic acid, a powerful antioxidant that helps to eliminate free radicals and reduce risk of cancer. “Easy Pha-max Wheatgrass is the most trusted wheatgrass brand that powerfully preserves its proteins, vitamins, minerals, enzymes, and chlorophyll. 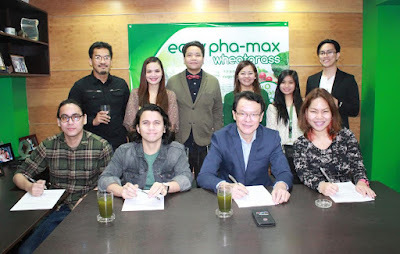 With Sponge Cola’s well-rounded personality and active lifestyle, Easy Pha-max Wheatgrass health enhancing benefits helps them be at their best while inspiring the wellness-conscious millennial market”, says Wheatgrass CAN International Inc. President Edward Ling. Standing (L to R) Sponge Cola bassist Gosh Dilay, Wheatgrass CAN International product manager Armi Rose Montano, Sponge Cola drummer Ted Mark Cruz, Phil-US registered dietitian-nutritionist consultant Cheshire Que, Wheatgrass CAN International Inc. licensed nutritionist-dietitian Babyruth Balderama, and Sponge Cola guitarist Erwin Armovit. Seated (L-R) Sponge Cola band manager Saul Ulanday, Sponge Cola vocalist Yael Yuzon, Wheatgrass CAN International Inc. President Edward Ling and Sponge Cola PR representative Ernestina Magboo. Easy Pha-max Wheatgrass is FDA-approved and comes in original, honey, and lemon flavors and available in all Mercury Drugstores, S&R, Watsons, and other leading supermarkets nationwide. For order and inquires, contact Customer Service Hotline at (02) 8901111 or 09055757799 and follow social media pages: Wheatgrass C.A.N on Facebook and @ilovewheatgrass on Instagram and Twitter.